I know a lot of parents out there will be totally familiar with the sticking-your-face-in-the-pantry-hiding-from-the-kids or ducking-down-behind-the-cupboards-hiding-from-the-kids snacking manoeuvre? Maybe you’ve decided that they’ve had plenty of crackers already (but you haven’t, of course… our tummies are bigger, right?!?). Maybe it’s just too close to their dinnertime but you need a little something to pull you through that afternoon slump. Whatever the reason is, I think it’s safe to say that we’ve all done it. Now, I’m not normally one for deception when it comes to raising kids. T has questions, I dutifully answer in the most truthful yet age-appropriate way. Even the trickiest of tricky questions – life, death, reproduction. All the heavy stuff, I answer honestly. If I’m having a less-than-sunny day, I am totally upfront with T about how I’m feeling. But boy, have I been getting sneaky these last couple of days! I had a little sneaky duck down behind the cupboards this morning to eat while I was packing our lunches and T was eating his breakfast. I had a little sneak behind the pantry door yesterday afternoon when it was just too close to dinnertime. And the cause of all this sneaky deception? 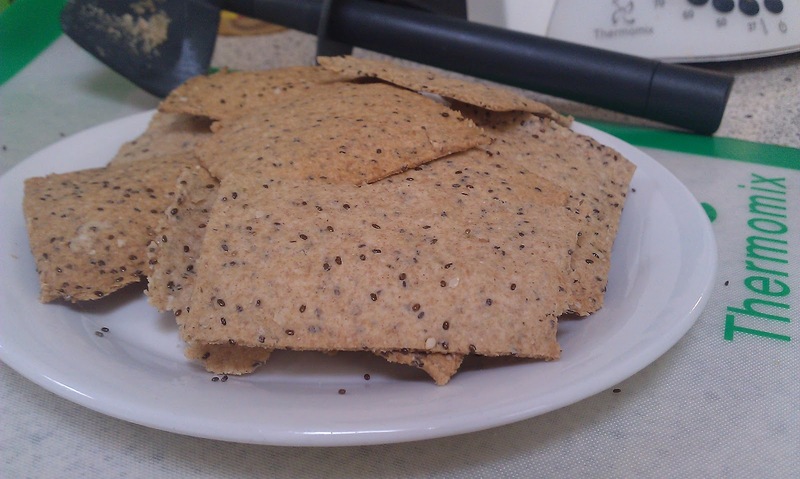 Some seriously scrumptious lavosh crackers! These were just so easy, and so delicious. You can change up the grains, change up the seeds, the spices… Whatever you have on hand, you can get a different yet equally delicious result each time. Cooking for a big group? Just make a few batches, using different seeds and spices in each batch for a bit of variety. Here’s the recipe for the ones I made this week. 2) Weigh spelt grains into TM bowl, mill on speed 9 for 1 minute. 3) Add all remaining ingredients except water. 4) Mix on reverse, speed 6 for 20 seconds or until well combined. 5) With the blades still running on reverse and speed 6, pour the water in through the hole in the lid until you get a soft, pliable dough that holds together but is not too sticky to work with. The amount of water will depend on various factors; humidity, storage of ingredients, etc etc, but you should use close to the full 120g of water if not all of it. 6) Tip dough onto breadmat or benchtop – carefully, as inevitably not all the seeds will stay stuck into the dough and you don’t want seeds all over the kitchen. 7) Simply squoosh the dough together with your hands, rip roughly into four pieces and roll one piece out as thin as you can. 8) Cut the dough roughly (it doesn’t really matter how big the crackers are, just that they’re all roughly the same size as one another) and arrange on a lined baking tray. Repeat with remaining dough. 9) Bake them in the oven, one tray at a time, for about 12 minutes until golden brown and crisp (check after 10 minutes, can take up to about 15 minutes depending on the thickness of your crackers). 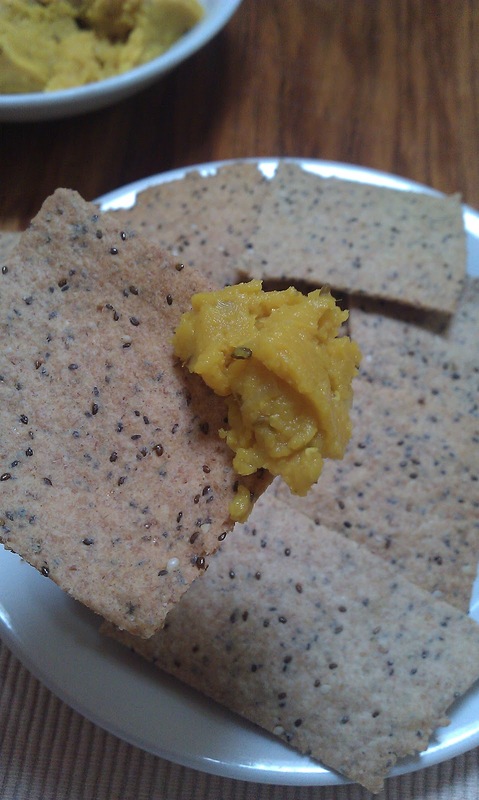 10) Make a yummy dip to go with them, or dip into some leftovers – we used leftover Yellow Dahl and had it for lunch along with some veggie sticks.